Doors open at 11:30 for an opportunity for participants to network with other tech professionals and grab lunch before the educational session kicks off at 12:00 pm. You are welcome to bring lunch, however, food will be provided free to all participants. “The Evolution of CyberWarfare…is Defense in Depth Enough? ” Sometimes a Defense in Depth approach can create a false sense of security. Additionally, one can get overwhelmed by the myriad of frameworks and controls. We’ll explore one such approach and some ways to improve upon it. 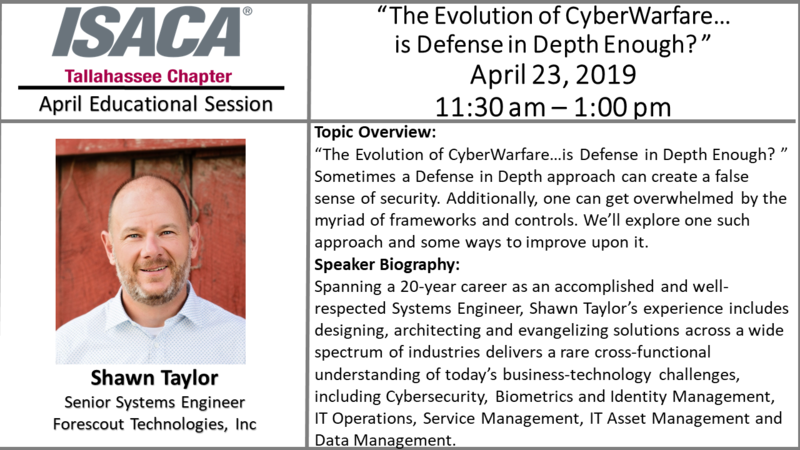 Spanning a 20-year career as an accomplished and well-respected Systems Engineer, Shawn Taylor’s experience includes designing, architecting and evangelizing solutions across a wide spectrum of industries delivers a rare cross-functional understanding of today’s business-technology challenges, including Cybersecurity, Biometrics and Identity Management, IT Operations, Service Management, IT Asset Management and Data Management.